The amount of food that is not eaten and goes to waste worldwide is staggering. According to WRAP, in the UK, 85% of food arising from households and food manufacturing goes to waste (with household waste making up 70%). An inquiry in 2014 by the UK government reported an estimated 89 million tonnes of food are wasted every year in the EU, which is expected to rise to around 126m tonnes by 2020 if no action is taken. In comparison around 41 million tonnes of food are purchased in the UK (mainly for home use), meaning we all waste around a quarter of our weekly shop! Worldwide, according to FAO, roughly one third of the food produced for human consumption every year — approximately 1.3 billion tonnes — gets lost or wasted. In recent years we have seen an increase in awareness surrounding sustainability, waste reduction, recycling, and reducing our overall consumption levels. Across the UK many of us are doing our best to recycle household waste, reduce consumption of goods and services and use water and energy supplies responsibly to reduce greenhouse gas emissions. Many of us choose to travel in ways that are greener, such as cycling or car share schemes. On an individual level, how we choose to consume, recycle, travel and use resources sustainably will have a measurable impact on greenhouse gas emissions and therefore climate change. Earthworm Watch is inviting everyone to take action in gardens, allotments and green spaces by doing our survey and counting earthworms, categorising the soil type and carbon content. Earthworms store carbon in the soil by recycling decaying organic material on the surface, feeding on the soil and creating nutrient rich waste (which can be taken up by plants) through their burrowing activities. This creates spaces for air and water which benefits many plants and animals. Our latest Earthworm Watch Experiment is a new opportunity for you to deepen your experience of Earthworm Watch and help our scientists learn more about the best habitats for earthworms. Following on from completing the Earthworm Watch survey, the experiment asks you to manipulate one square of habitat by adding a form of compost or organic material. After a month you will be able to re-survey, to see how it compares with the regular square (left unchanged!). Find out more about the experiment here, register and download the instructions to begin. There are earthworm species that absolutely adore compost and thrive on the kitchen and garden food waste that you could compost rather than throwing it away. 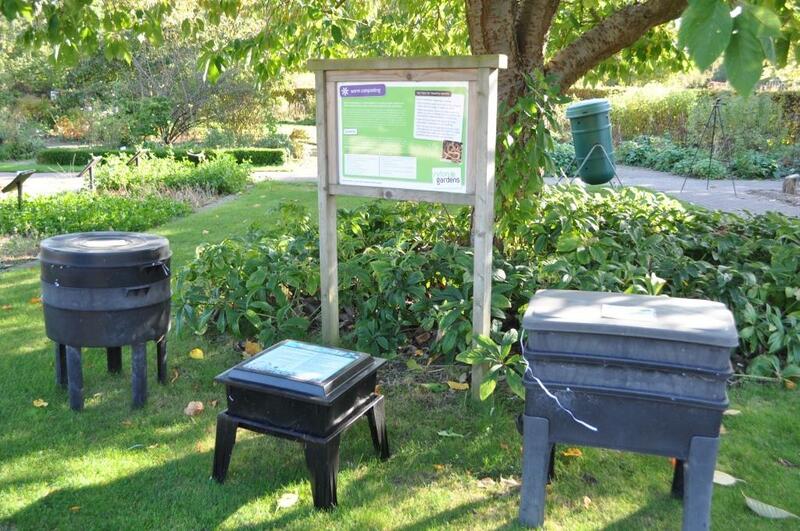 There is plenty of composting information available on the Garden Organic website, and we thank their Master Composters who have been actively promoting Earthworm Watch. I personally have the classic black compost bin and amazingly all you need to do is build or buy your own and compost earthworms will find it! In a previous blog we mentioned Eisenia fetida, a beautiful stripy earthworm that can consume up to its own weight in decaying vegetable matter each day and through process of digestion convert this material to a mineral state that is then available as nutrients for plants. The types of vegetable and garden waste that E. fetida could feed on include ‘greens’ such as tea bags, grass cuttings and vegetable peelings and ‘browns’ such as egg shells, cardboard and garden prunings. It is important to get the right balance of ‘greens’ and ‘browns’ in your compost. If the compost material is too wet if will give off an odour; if it is too dry then it will not rot effectively. Air between the compost is essential and important for earthworms too. The tiger worm Eisenia fetida prefers warmer, drier compost material compared with the European nightcrawler, Dendrobaena veneta, a second species that you may find (which is also striped, its clitellum or saddle is pale yellow-pink) which prefers cooler, wetter conditions with more space. Composting and The Earthworm Watch Experiment are activities, that along with building a log pile or a wormery will help to recycle your household and kitchen waste and increase the diversity of earthworm species in your gardens and allotments (The Royal Horticultural Society have some excellent links on creating your own wormery). These are small, individual actions that you can do to reduce waste and help save our planet!